The picture was produced independently by C.G.K. Productions, and distributed in the United States by Allied Artists Pictures Corporation. The film was distributed theatrically in 1956 on a double bill with World Without End (and in some areas with Invasion of the Body Snatchers). * Marvin Press was misidentified as Marvin Ellis (the last name of his character) in all the film's publicity. Worse, his name was entirely omitted from the screen cast list. Chaney has almost no dialogue in the film. His character's emotions were shown through extreme close-ups of his face. Angels Flight appears prominently in this film. The Bradbury Building interior is featured prominently in this film. Production stills exist of scenes not in the film as released. One shows Butcher Benton at a jail where a policeman's body lies on the ground as Benton carries off Eva Martin. 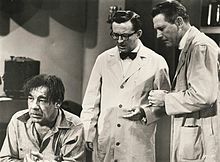 The scene logically came after the police threatened to release Paul Lowe from custody if he does not reveal the location of Benton's loot, and before the scene where it is revealed Eva has checked herself out of a hospital, presumably after recovering from unspecified injuries. Presumably, this scene is where Benton made good on his threat to get Paul Lowe, breaking into the jail to do it. Although Joe Flynn played a serious role in this film, audiences laughed at him. This convinced him that comedy was his forte, and he later specialized in comedic roles, most memorably as the irascible Captain Binghamton on TV's McHale's Navy (1962-66). The full story of the making of the movie (complete with interviews with some of the participants) plus the script and pressbook are featured in the book "Scripts from the Crypt: 'Indestructible Man'" (BearManor, 2015) by Tom Weaver. John Darnielle of the Mountain Goats wrote and performed "Rotten Stinking Mouthpiece" as an homage to one of the lines Chaney delivers to his double-crossing lawyer in Indestructable Man. The film has been released by numerous studios as a "bargain bin" disc. In addition, the MST3K version of the film has been released by Rhino Home Video as part of the Collection, Volume 11 box set. 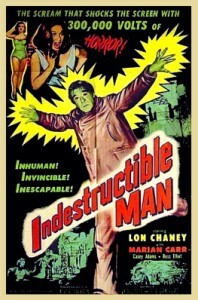 Wikimedia Commons has media related to Indestructible Man. This page was last edited on 8 April 2019, at 09:16 (UTC).